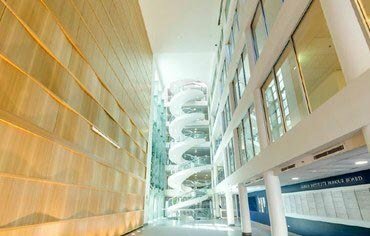 Garvan's galleria incorporates a reception area and event space abutted by the Institute's iconic DNA-inspired helical staircase, one of two centrepieces in architect Ken Woolley's building design (the other being the atrium area above the Curran Foundation Library). The galleria is available to hire by organisations and members of the public, and has a capacity of 100 seated / 250 standing. Please contact Building Services Manager Lynn Croft at l.croft@garvan.org.au or on 02 9295 8160 for information.